Despite the despair that has resulted in the refugee crisis in Europe, with people fleeing their war-torn homes, you don’t need to look too far before seeing a beacon of hope. Abid Ali’s story is one such example. He is one of the people who fled Pakistan for Europe in 2015, venturing from Turkey to Greece in a rubber dinghy seeking a better life. Now three year’s on, and the tailor is putting his skills to use, while also helping Greece in the meantime. Mr Ali is one of the refugees upcycling the rubber found on beaches in Greece from abandoned refugee boats – similar to the one he arrived on – to make fashion accessories. 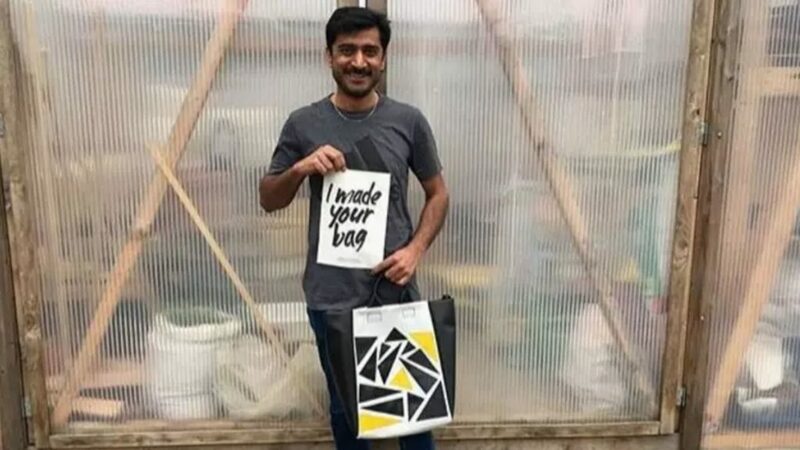 Based out of a workshop in Berlin, he has teamed up with not-for-profit organisation Mimycri and is making handbags, backpacks and even sneakers. “Sometimes I think ‘yes I came with these boats’, but no it isn’t too strange for me,” said Mr Ali. The year Mr Ali arrived, Germany took on over a million refugees, and so Mimycri, the brainchild of Vera Guenther and Nora Azzaoui, is doing its part to welcome and integrate them by creating jobs to put their skills to use, and in turn find purpose in their new home. The pair thought up the concept while volunteering with refugees on the Greek island of Chios in the summer of 2015. “We want to process the plastic waste that lies on beaches in Greece into something new,” Ms Guenther said. In addition to helping refugees, the concept is also an environmentally friendly way of assisting Greece with waste management when it comes to the copious amounts of plastic discarded on beaches in the form of life vests and rubber boats.